I have some new walls for you all! Up second is another grasscloth pattern. I really really like grasscloth (and you may have seen), it adds a textural element to a room. Don't expect the grasscloth to be seamless horizontally, that is how grasscloth comes naturally. It adds to the charm of the wallpaper and makes it one of my favourite walls to decorate with. So if you don't like that grasscloth isn't seamless, i would advise against you downloading this wallpaper, Grasscloth is not seamless due to the method of production, and neither are these. They are still lovely, but not everyone's cup of tea. 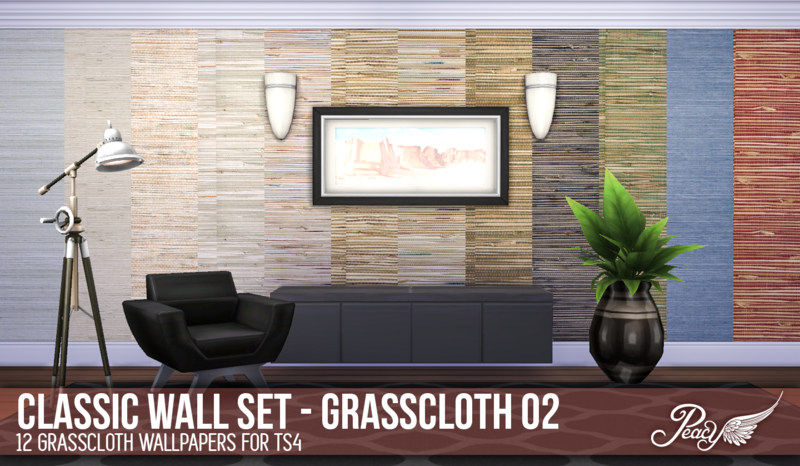 Hi there, just wanted to say that I am loving the grasscloth wallpaper (both sets)! Good work. :) They look phenomenal in-game.